A stunning smile brightens the room and transforms even the dreariest of days, especially when you are the one wearing the incredible smile. If you live in Winter Haven, Florida, you can have a brilliant, beautiful smile with orthodontic care from Orthodontic Specialists of Florida, conveniently located at 1074 Spring Lake Square in Winter Haven. 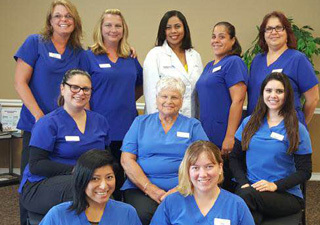 Dr. Keisha N. Alexander and her staff look forward to welcoming you and your family to our office! People who live and work in Winter Haven and the Wyhdham, Waterford Oaks and Mallard Lake communities trust Orthodontic Specialists of Florida for all their orthodontic needs. We also offer discounts for Legoland staff and employees. Routine dental care helps you keep your teeth and gums healthy. Examinations and cleanings remove plaque, bacteria and tartar that can lead to gum disease, tooth loss, and other problems. But what if you have crooked teeth that trap food particles, gaps that expose your gums or a misaligned bite? A general dentist is not able to correct these types of problems, so you may be referred to an orthodontist. Braces and other dental appliances are used to correct problems with your teeth. No two patients are the same when it comes to orthodontic care, so your braces may involve different appliances than someone else’s braces. The most common type of braces, especially for children, are metal braces. Metal braces are made of stainless steel and include brackets that are attached to the front of your teeth and connecting wires that thread through the brackets. You may also need to wear elastics, headgear and complementary appliances with your braces. Orthodontic treatment and wearing braces is often perceived as something we all experience as teenagers. Treatment is also beneficial for children and adults. For children and teenagers, orthodontic treatment early in life sets them up for a lifetime of healthy teeth and good oral healthcare habits. Having a beautiful smile at an early age also helps build self-confidence. For adults, orthodontic treatment can be the advantage you need to improve tooth and gum health while boosting self-esteem. Dr. Keisha N. Alexander has a Doctorate in Dental Surgery and a Master of Science in Orthodontics and Dental Facial Orthopedics. In 2008, she started working with families in Florida to bring her unique approach and compassionate care to patients of all ages. Her expertise includes specializing in cases that require both orthodontic treatment and orthognathic surgery, but she enjoys working with families who need all levels of orthodontic treatment. Having a great smile is exciting, but we understand that orthodontic treatment may feel a little overwhelming. We want all our patients to feel comfortable during every appointment, so we have designed our office to be very family-friendly. Dr. Alexander always welcomes new patients, and your initial consultation is FREE. We also provide FREE second opinions. Contact our office today or come by our Winter Haven office!